Can you believe Thanksgiving is already knocking at our door?! Where does the time go! To help make this holiday season a little less frantic this year we have put together an awesome round-up of some of the cutest and cheapest ways to dress up your Thanksgiving table. Let us know which is your favorite! These Utensil Holders are simple and minimalistic, not to mention great conversation starters that add something special to the table. 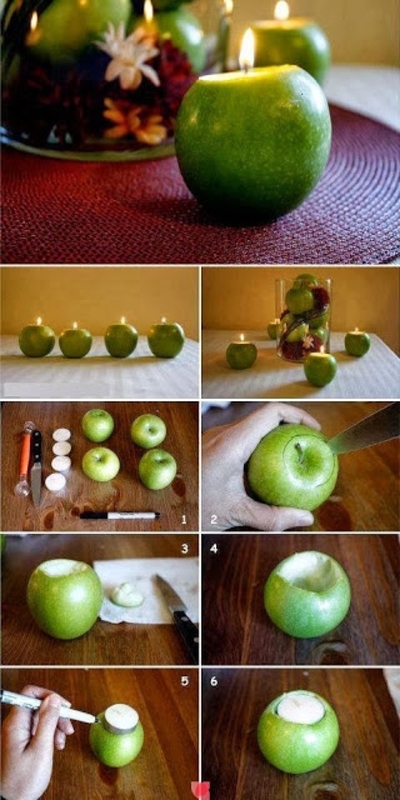 Turn apples into candles to save money and make your house smell great! These are adorable, and great to keep the conversation flowing all throughout dinnertime. This will be great for any kind of dip or fondue, salty or sweet. Life is Poppin’s Pumpkin Whip Dip would be a perfect addition! Serve small appetizers in gourds – it adds the perfect fall touch to your table. Wow your family and friends with this fantastic napkin fold, before you start digging in on all the delicious food! Who says sitting at the kids table has to be boring? You’ll have the adults wanting to get in on the fun too! Give fallen leaves one last chance to shine, with these glowing candle holders. This is one of the most fun and clever ideas I have seen! It’s definitely my favorite. Have you ever thought about making your own leftover station for your guests to take home their favorites from the night? These place cards are so cute and easy to make! The only problem will be finishing enough wine bottles to get all the corks – wait, that’s actually not a problem at all. These placemats will warm your hearts while keeping your table clean at the same time. No tutorial needed, just grab a festive color spray paint and some leaves from the back yard. It will be the perfect accent to your table. Another great addition to the kids table, and perfectly educational at that! Spray paint fruit gold to accent your table, or put them in a bowl as a beautiful centerpiece. This “Give-Thanks” jar is perfect to give guests something to do before dinner starts! Add your menu to these chargers with chalkboard paint, if you’re not having a buffet style dinner. These word-searches will keep the kids entertained if they get antsy waiting for the food! Finally, send your guests home at the end of the day with these Mulling Spice Party favors! Hopefully these Thanksgiving tips will help you have a totally instagram-worthy table this year – or if you don’t instagram, I’m sure you’ll still have more than impressed friends and family! What’s your favorite way to dress your Thanksgiving table? Awesome article, gold fruit just blows my mind! Will it be Ok if I link to this amazing post from my site http://essaykitchen.com/ ?